Use ABC FiberSpray to effectively encapsulate small areas of asbestos containing material (ACM). Place ABC FiberSpray in the pouch within the glovebag. Apply ABC FiberSpray to seal the friable pipe insulation ends after the insulation has been removed. Use ABC FiberSpray to “lockdown” residual microscopic fibers to the substrate. Apply ABC FiberSpray to friable areas after bulk samples have been removed from the ACM or suspected ACM. Shake well before spaying. If nozzle orifice is clogged, remove the dried film from the cap or replace with an extra nozzle (provided upon request). 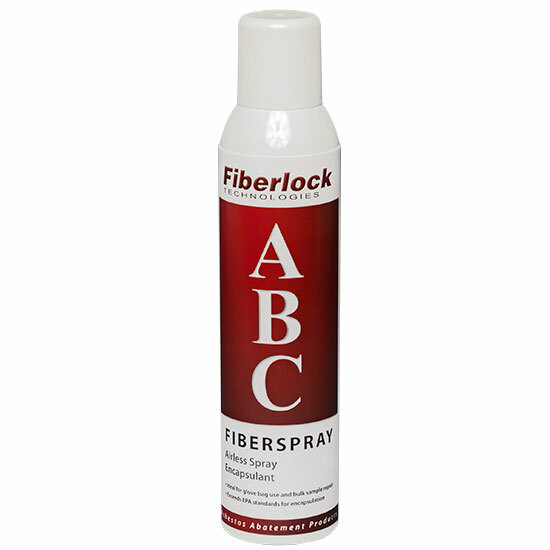 Apply ABC FiberSpray by spraying the surface from a distance of 8 to 12 inches. Clean the nozzle with warm soapy water before the coating dries. Store in a dry place at temperatures between 40°F (4.5°C) and 90°F (32°C). Approved respirators must be used to prevent inhalation of asbestos fibers that may be present in the air. Protective clothing should be worn. Tools and drippings should be cleaned immediately with clean, soapy water before the coating dries. Careful consideration should be given to all Environmental Protection Agency (EPA), OSHA and state regulations in effect at the time of application of ABC FiberSpray.